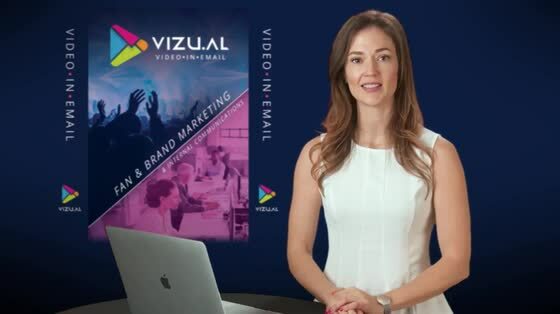 Finally: Video That Plays Directly Within Email: "VIZUAL"
Audio-in-Email: Embed presentations, podcasts, or create animated image-slideshows with music or voiceover. Image-Carousels: Create an interactive, thumb-tappable slideshow of product images or fan-pictures. Countdown-Clocks: Create a sense of urgency with real-time dynamic count-clocks. Animated-GIF Builder: Create engaging animated gif's using your own images. Real-time Geo-dynamic Images: Dynamically match users to a specific location - and create a localized image on the fly. Mobile vs. Desktop images: Show different images based on the device being used. A/B Testing, Real-Time-Optimization Images: Not sure which image will generate the most clicks? We have you covered. More than DOUBLE your normal email click-throughs. 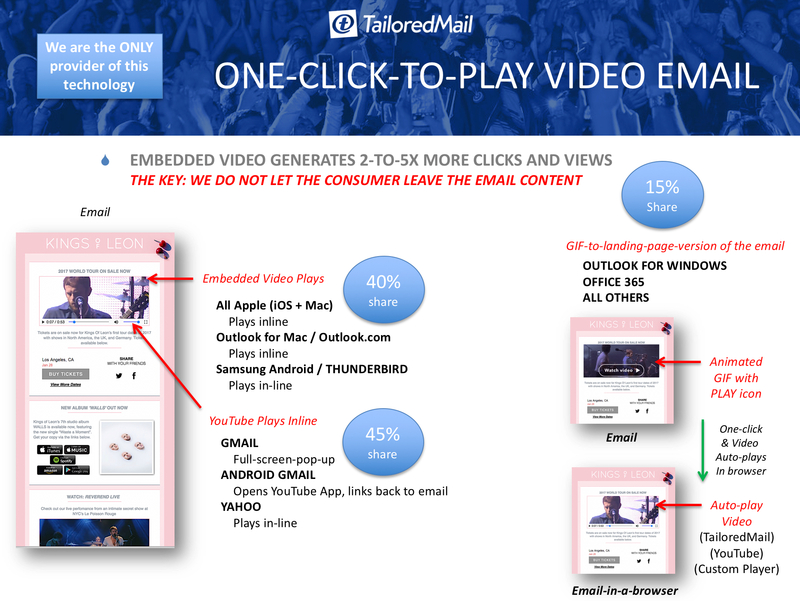 We are the only email-marketing-provider in the world to offer true embedded-video that can play directly inside all of your email. Strategically, videos are automatically whitelisted with Twitter and Facebook, and can be fully shared by your subscribers (and fully tracked) in your campaigns. This dramatically extends the viral-reach of your videos, and gives you unprecedented tracking of who your most influential subscribers/fans are. "OUR MINDS ARE BLOWN. TailoredMail is enabling email to do things we never thought were possible." 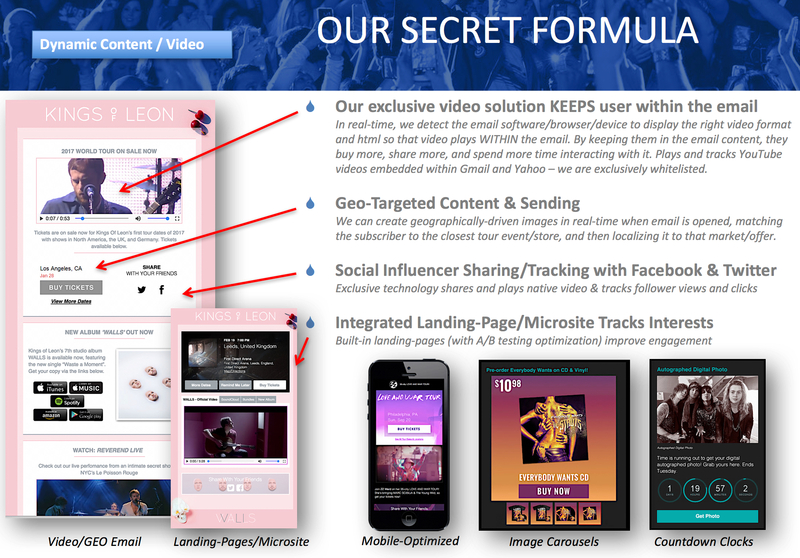 In less than 5 minutes, you can embed videos into your campaigns for immediate sending. We track each individual subscriber's viewing behavior, such as how many times they viewed, how much of the video was viewed, social-sharing behavior, and what device/platform they were using. 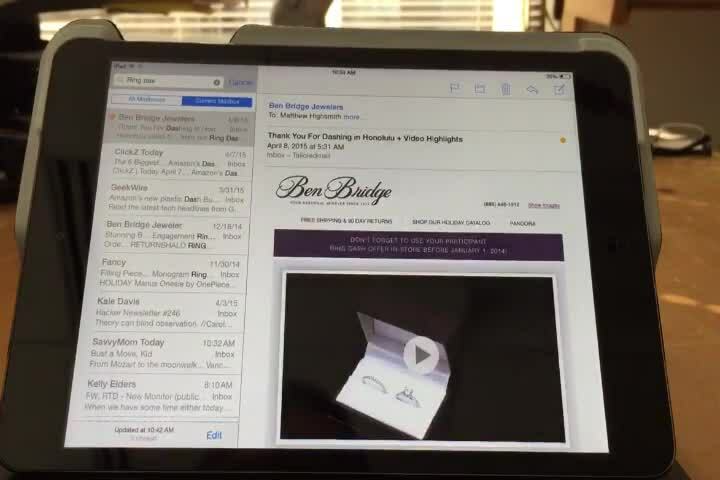 Video plays INSIDE the email content you send. Gmail, Yahoo, iPhones - you name it. 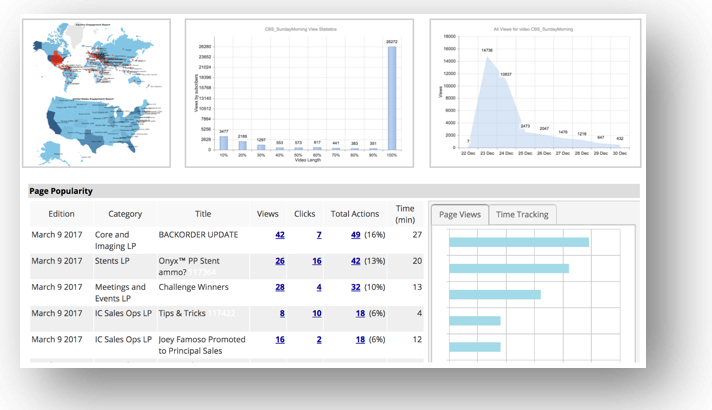 Our secret sauce: we auto-detect more than 100 unique devices, email clients and operating-system environments - in real-time - and serve up different formats to offer everyone a one-click-to-play experience. The solution is hosted and streamed from TailoredMail's Amazon cloud (using edge-servers for instant worldwide playing). You can optionally set it to auto-play, be muted, show/don't-show video player controls, and much more. Your subscribers don't have to download any 'players' or have Flash — it just works (using standard HTML5, plus our breakthrough techniques). 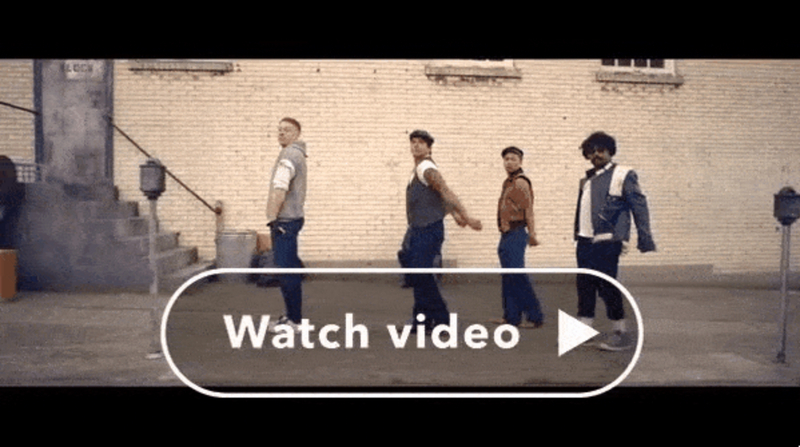 HTML5 is everywhere, but it's not technically possible for email marketers to create a working (let alone elegant) video-in-email experience on their own. If you did try to do it on your own, you might make it work in a few environments, but then it will break in most others. This sophisticated detection system is what makes video-in-email possible. The above averages about 80-85% of emails opened in the B2C world, and about 65% in the B2B world. More importantly - regardless of B2B or B2C, over 50% of emails are opened on smartphone devices, and virtually all smartphone devices support embedded-video directly. TailoredMail's unique approach here dramatically improves viewings of the video. First, the animated GIF increases clicks by more than three times. Second, a browser window opens and the video starts playing instantly - and the subscribers stays within the email content you sent. Our A/B testing shows that when this is done, it can more than double click-throughs of other content in your email. The truth is this; if you send the recipient to YouTube or Vimeo to watch the video, they never return to the email - and your sales or communication goals are not achieved. Outlook for Windows uses Microsoft Word as its 'display engine', and as such does not support video, and will only show the first frame of an animated-GIF. But - importantly - it is still a one-click-to-play experience, and it's fully tracked! Outlook for Windows now represents less than 10% in email views - and for some B2C audiences, it can be as low as 3%. And, with so many corporate audiences reading their email on iPhones (our stats/research show more than 50%), TailoredMail's approach dramatically increases the engagement across your entire subscriber-base. Automatically creates elegant animated GIFs of your video - fully customizable (or upload your own).